A gentle, effective exfoliator that instantly smoothes your hands. Your skin feels soft and moisturised whilst nails and cuticles are conditioned. Our therapists recommend massaging gently into your hands pushing back the cuticles with the scrub. Rinse well after use. On the face of it, this is not a bad hand scrub. Everything from the sophisticated gold-toned packaging to the thick, heavy, oily texture that is the scrub screams spa luxury. It has a wonderful pick-me-up smell of orange peel (whose oil this product does contain) and the rough salt granules do a good job of exfoliating my hands. After rinsing off, my hands feel moisturised but icky uncomfortable due to the heavy layer of oily residue left on the skin. 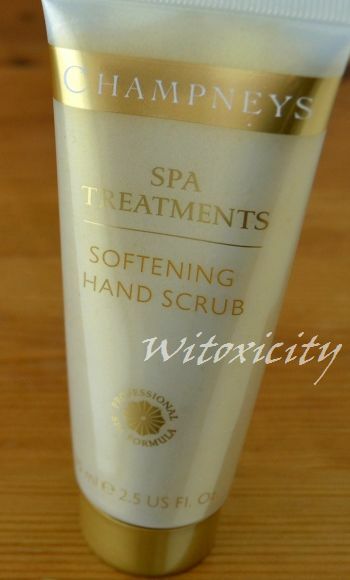 The price of the hand scrub is all right: €7.45 / £6.00 for 75ml. It seems quite reasonable considering that Champneys has an upmarket brand image in the UK. However, here's where I have a bone to pick with Champneys. I had a good look at the list of ingredients and while the Champneys Softening Hand Scrub contains lovely botanical ingredients like sweet almond oil, jojoba seed oil, olive seed powder, orange peel oil and Carapa guaianensis seed oil, it also contains other ingredients that I'm trying to avoid. The second ingredient listed, after the salt, is a mineral oil. 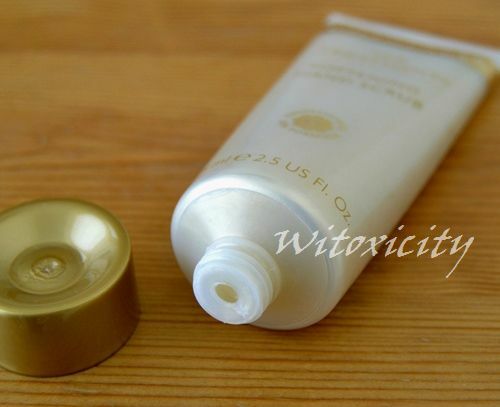 The fifth ingredient is petrolatum. Right. So, that must be the reason for the heavy texture of the scrub! I admit I still have things like Vaseline at home, leftover from the old days when I used to buy it in vats. It's still handy to have for emergencies - great for preventing scalds from developing/getting infected. Sure, I also have a bit of the Lucas' Papaw Ointment (petroleum jelly + fermented papaya) and Aquaphor (petrolatum + ceresin + lanolin alcohol), but a hand scrub that is predominantly mineral oil-based?! No, thanks. I could jolly well have made this scrub at home by mixing salt granules with Vaseline and adding one or two drops of sweet almond oil, jojoba seed oil and orange peel oil to soothe my conscience. And for much less than €7.45 too. For the record, I didn't buy this hand scrub and neither was I sent this tube by the brand. A friend of mine got it from someone and passed it to me. I know I wouldn't have bought it in the store after reading its list of ingredients. So, ladies, I'm not giving this hand scrub a thumbs up. It's a shame, really. After all, Champneys is a household name in the UK and is synonymous with spa retreat for the rich and famous. Think of any British celebrity (dead or alive) and chances are, they've been pampered at Champneys before. Champneys is a family-owned business with a chain of four luxury health spa resorts and several day spa centres in England. It also owns a ski hotel in Switzerland and runs its own training college for beauty therapists. One would be inclined to think that "Champneys" is the family name of the owners but no, it's actually Purdew. Dorothy Purdew was spurred on to start a slimming club of her own after getting snubbed in her application to be a Weight Watchers group leader (ironic, isn't it?). With the help of her husband, Robert, she started WeightGuard in 1970 with a £60 loan from her father. WeightGuard was a huge success, eventually paving the way for expansion into the health farm business. Unfortunately, Mr Robert Purdew passed away in 1990, leaving Mrs Purdew and son, Stephen, to run the business. The name Champneys comes from a converted mansion that they acquired in Tring, Hertfordshire in 2002. It is said that the mansion was owned by a Ralph de Champneys in 1307. A naturopath, Stanley Leif, bought the mansion from the Rothchilds in the 1920s and converted it into a health farm, the first in the UK and a pioneer in the health spa industry, they say. The Purdews wanted a unified brand name for their by-then four health farms and while the name "Purdew" was an option, "Champneys" made more business sense. It was already a well-known and established brand with so much heritage, so why waste it? For the Champneys experience at home, Champneys launched in 2004 its own collection of beauty products which were sold exclusively in Sainsbury's. That partnership ended last year and Boots is now the retailer of Champneys' products. By the way, Mrs Dorothy Purdew OBE celebrated her 80th birthday early this year and is still involved in the management of Champneys. Last year, she had her autobiography published (it was her son's idea, not hers), The Long Road to Champneys: The Extraordinary Life of a Pioneering Spa Queen. It's an inspiring read, giving readers a glimpse of her life and what went on behind the scenes at Champneys, even including a bit about the late George Best who stayed at Champneys Forest Mere for two years after his controversial liver transplant. Well, Champneys, it would be great if you could drop the mineral oils and maybe I'll book myself a weekend retreat at Champneys Tring one day. One fine day. Champneys products are available through Boots, eg: Boots UK and Boots Nederland, and Target in the US. What a great review! I think I'm going to head over to Target and get me some! I don't mind mineral oil, I use to think it was bad, but I use this hand oil by Yves Rocher that has mineral oil in it and my hands are really soft and hydrated after I use it... I don't know what to think anymore. I agree about the conscience thing. It is better to avoid petroleum based products from an environmental stand point, most definitely. Hey, if you want I can get you some Burt's bees stuff. If there's something you want, I don't mind looking for it - anytime! Hey, KTee! No, at the moment, I'm not doing much blending and mixing myself but that bit with Vaseline and salt, it's an easy one to start off with. Haha!